It’s week 5 of the One Room Challenge. Today I’m chatting about lighting and furniture, and I’ve got a quick update on my DIY shelf. If you recall, last week I was racking my brain trying to figure out a way to make stylish but strong record shelving. I played around with the idea of don’t a version of pipe shelving but ended up landing on a WAY simpler solution. I’m talking a ZERO tools required DIY! 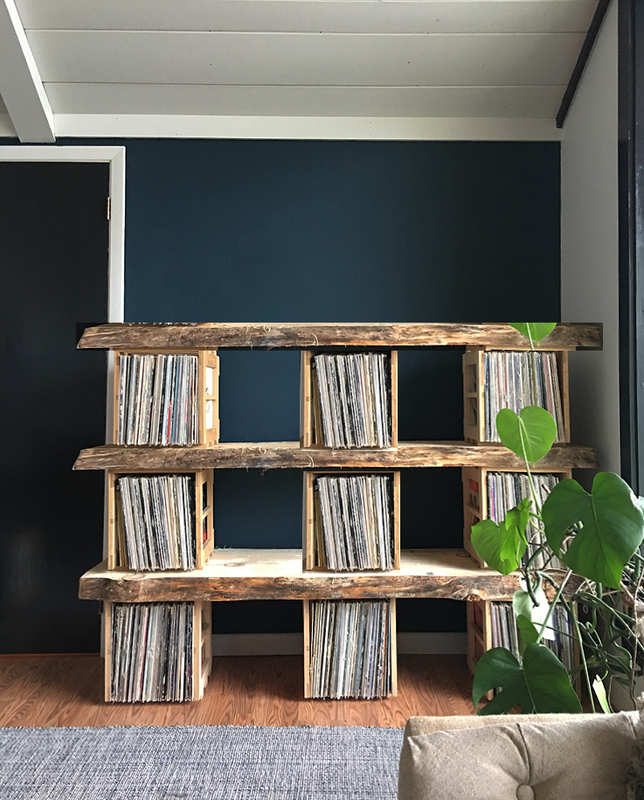 A few years back we started using simple stacking record crates for lack of a better storage solution. I love everything about them from a functional standpoint. However, I wanted something with a little more style. What I’ve discovered from my failed attempts to create record storage is that you need cubby-style shelving like the ones above. 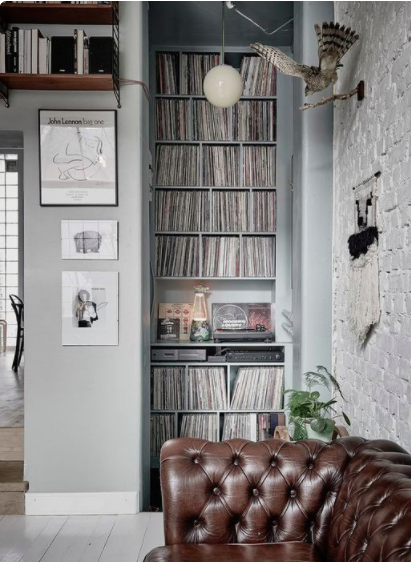 Long lengths of undivided shelving make flipping through records impossible! Last week I found a few live edge planks for sale and picked them up over the weekend intending to use them to create the pipe selves. After a little tinkering, I decided to try and re-purpose our boring but well-made cubbies by stacking them between the large wood slabs. I’m happy to report that stacking seems to work just fine, in fact, it feels very sturdy as is with no reinforcement. I bought 4 of these live edge boards, but given the height of the ceiling on this wall, I’ll probably limit my stack to 3 planks high. See where I’m going with this? Pardon my PhotoShop job! 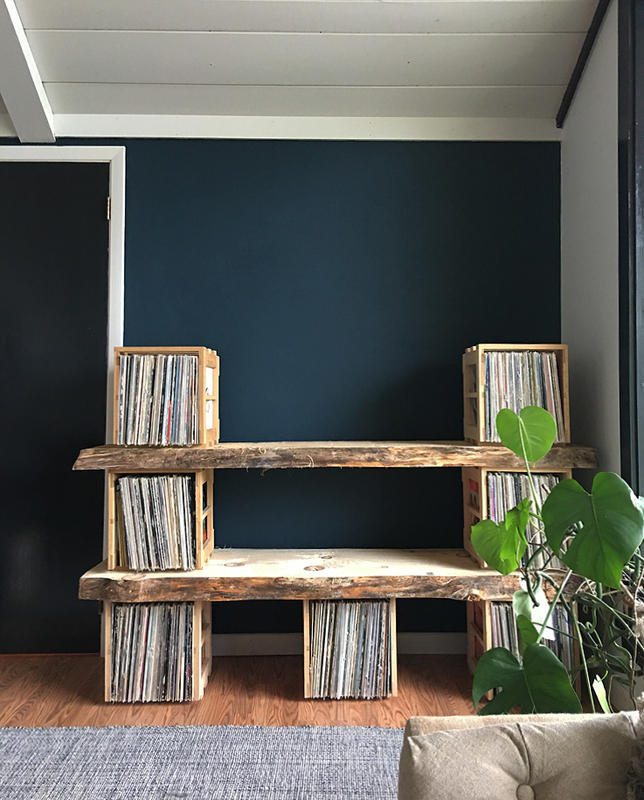 My only question is should I paint the record cubes a darker color so that the shelves appear to float? With a little styling, I think I can make this fell cool and intentional. 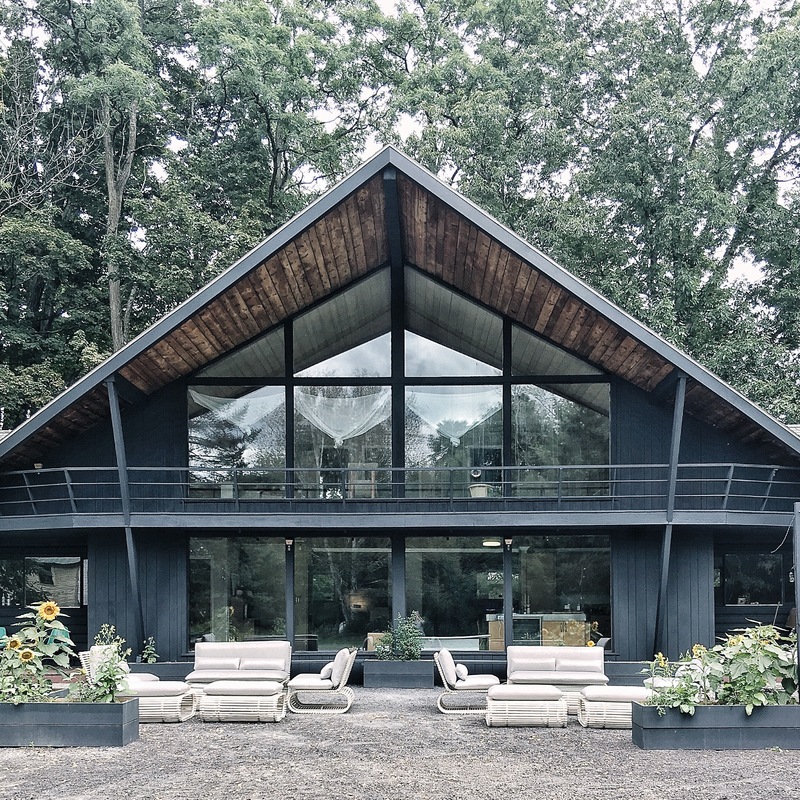 In other newest, we’ve got some serious windows here at The Woodhouse Lodge, and the a-frame roofline means that the interior ceiling, beams and ceiling fan are very obvious from the outside. Of course, you can’t see it in this picture but, our old, mega ugly ceiling fan is majorly visible from the exterior. I can’t wait to swap it out for our new Haiku fan. Usually, I’m not a great lover of ceiling fans, especially ones with lights! To be honest, I thought I might get rid of the ceiling fan until I realized how necessary it is for in the heating and cooling of the space. Luckily I found the super elegant Haiku, AKA the fan that changed my mind. For starters, the Haiku has an optional light that is so sleek you can hardly tell it’s there. Because the location of our fan is also the only place for an overhead light, I soooo appreciate the minimal design of the Haiku. On top of that, that the brightness and speed of the fan are fully adjustable via the wall mounted control or remote control. A function like this becomes super essential when your ceiling is 14 feet tall. Some of my other orders have started to arrive. I’m especially excited to lay out our Dash & Albert rug from Annie Selke and start playing around with the seating and side table placement. I have two smaller side tables that I’ll probably place next to chairs. I’m still toying with the exact arrangement, but the cocktail table is so narrow that it fits well between 2 chairs making it super practical for a tight space. 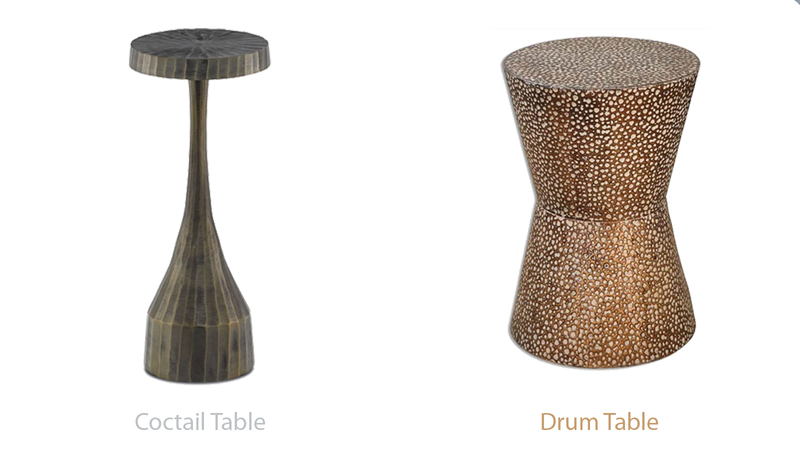 The drum table, with its more ample surface, has such an unusual texture and it looks amazing with a plant on top. 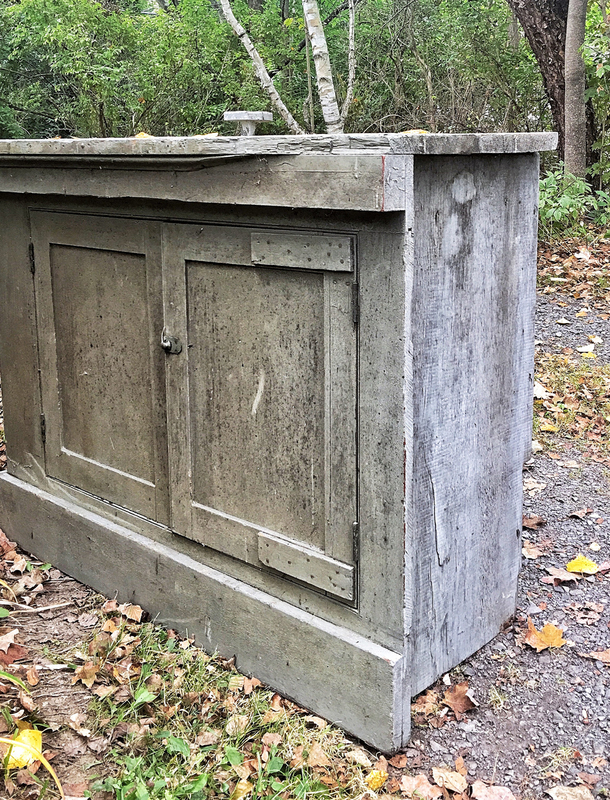 I fell in love with the above image, and when I spotted a vintage cabinet a few weeks back, I snagged it. 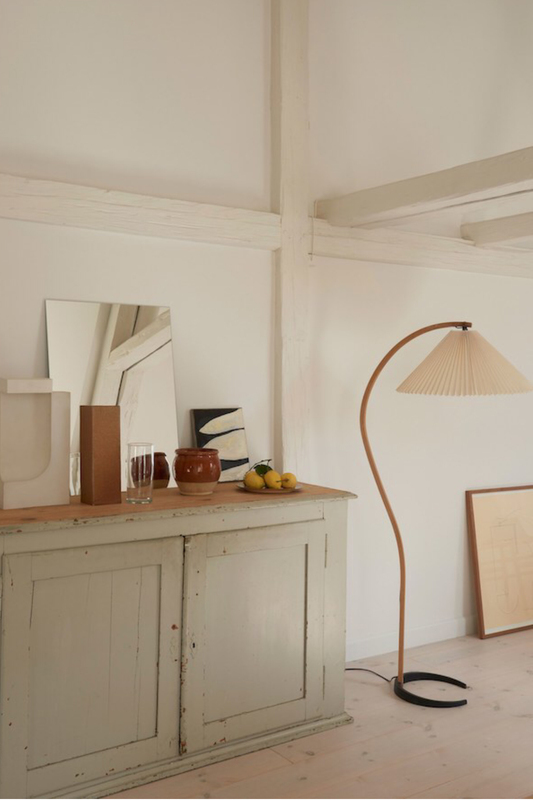 What I like about this picture is the way the styling and the lamp are modern, but they don’t disrupt the farmhouse vibes of the space. I think my vintage cabinet and this tripod light are really going to sit beautifully together. The scale is perfection IRL! I’m also going to try and work the TV into this scenario; we will see how that works out? ; ) To the side of the sofa I’m using a larger round vintage table. I’m excited to have all the surface area to work with. 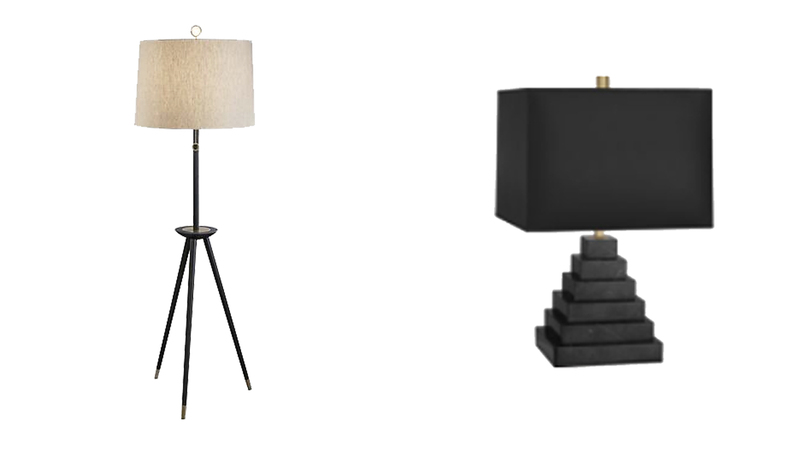 The main event on the table is a black marble table lamp. The shape is so bold and sculptural, its goign to be fun to search for just the right mix of old and new items to style the surface. This is the vintage cabinet that I’m using, I just put it in place, and I have to say it is great! As I’ve said from the begging, the success of this midcentury meets vintage look is going to be all about the styling. I’m so ready to layer in the vintage! Don’t forget to check in on all the other fabulous designers! That rustic/vintage cabinet mixed in with everything else is pretty fab! I vote to match your record cubbies to the wall color- then those gorgeous planks get to be the star! Hi Megan, just wondering – do you know if that wood is freshly cut or if it was kiln dried or stickered/air dried for a few years? I only ask because I once bought a green slab and after doing some research realized it wouldn’t be a viable long term solution… hard to tell from your photo – it looks like the bark was freshly planed off but that’s all I can see! Anyway, googling after I bought mine led me down a rabbit-hole reading about warping, checking, mold stains and despair – but I can laugh about it now! Who knew that wood needs about a year to dry per inch… not I! Hopefully yours are dried – not trying to be a debbie downer but I would worry about the paper record sleeves on Green wood as a long term thing. Humm! That’s a great question. It seems to be dry but it’s worth looking into. Thanks for bringing it up. How did you end up resolving your situation?